Sydney Writer’s Festival– my family attended the one event I managed to book. We saw Jeff Kinney, author and artist of “Diary of a Wimpy Kid“. He was a confident, humorous and excellent speaker who had both his adult and kid audience wanting more by the end of it. The event was filled with thousands of adults and kid fans. After his one hour presentation, we spent another hour and a half standing in the queue to get my daughter’s book signed. There was no time, unfortunately, to say anything or question the man. And then we had to rush home (it takes another couple of hours of travel to do so) as it was a school night. My daughter, an avid fan, and future writer herself, thoroughly enjoyed the day, although was incredibly tired and emotional the next day. So was I, to be honest. I started editing some of the earlier stories – a big step for me. This happened by accident, as I was tired and demotivated mid-week, so spent several hours working with my Scrivener Software, to work out how to convert a manuscript into an ebook – epub and mobi formats. It was a large learning curve for me. And hark, the ebook angels sung, and lo, I had an ebook. Okay, it’s only half done, but this was the first time I’d seen the thing out of it’s normal format on my computer screen. I took it on the road – to Sydney, and my daughter’s swimming lessons, and used the notes function in the Kindle app to make editing notes from my first and second read throughs. Writing and editing. Big steps for me. 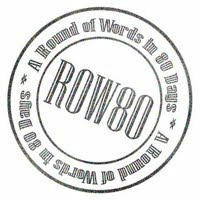 More writing progress, goals and perhaps non-successes too, found at ROW80.